Publisher: United Sates Brewers Association, 1976. Hard Cover, 125 pages, 8.75 x 11.25. Issued annually by the United States Brewers Association, the Brewers Almanac is a treasure trove of historical information regarding the American brewing industry. 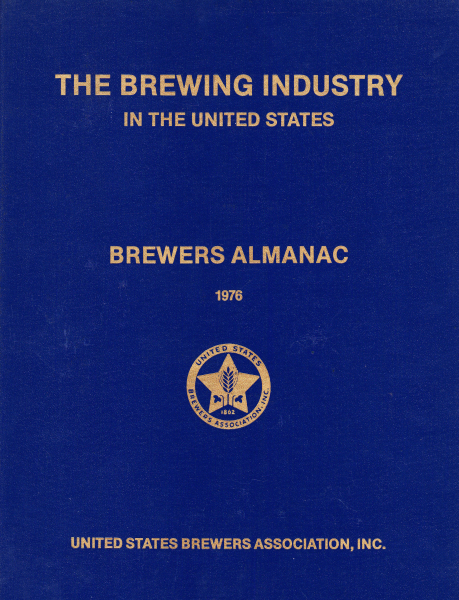 This 1976 edition contains historical production figures, packaging statistics (i.e., bottles vs. cans vs. kegs, etc. ), consumption figures, industry financial information, labor data, tax information, and a host of other analytics. The time period covered ranges from the 1860s through the date of publication. Packed with historical info cover to cover.